"If you go back inside, you'll never get out…" Aviron Pictures has released the first official trailer for a gritty new crime thriller titled The Informer, formerly known as Three Seconds before this new title, a film about an ex-con who goes undercover and intentionally gets himself incarcerated again in order to infiltrate the mob at a maximum security prison. 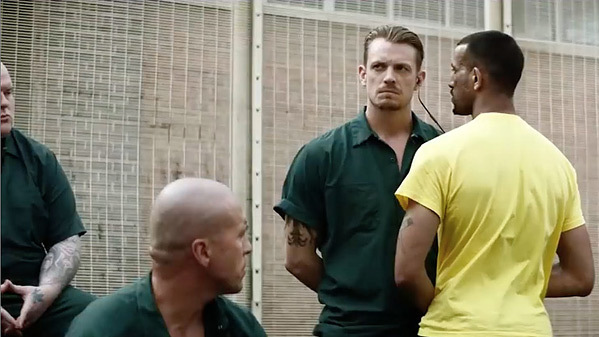 The film stars Joel Kinnaman as Pete Koslow, who gets caught in the middle of dangerous people with their own priorities. The film's cast includes Rosamund Pike, Clive Owen, Common, Ana de Armas, Sam Spruell, Ruth Bradley, Martin McCann, and Jenna Willis. Looks like one of those films that's extra convoluted just to give a crime action movie some plot that usually involves the CIA or FBI getting mixed up with criminals, and a good person having to risk everything to live. Ex-Special Ops Pete Koslow's (Joel Kinnaman) world is turned upside-down when hei s jailed after a fight to protect his wife (Ana de Armas). He's given a chance for early release by becoming an informant for the FBI and using his covert skills in an operation to take down The General, the most powerful crime boss in New York. But when the sting meant to finally earn his freedom results in the death of an undercover cop, Koslow finds himself caught in the crossfire between the mob and the FBI. The General insists Koslow takes the heat and sends him back to prison to spearhead a drug operation from inside, and the FBI affirms that going back to jail to do The General's bidding is the only way for him to keep his deal alive. Caught in a world of impossible choices, Koslow must return to prison, where he formulates a plan to escape the clutches of three of New York City's most powerful organizations –the mob, the NYPD and the FBI –in order to save himself and his family. The Informer is directed by Italian actor-turned-filmmaker Andrea Di Stefano, making his second feature film after Escobar: Paradise Lost in 2014 previously. The screenplay is written by Matt Cook, adapted from the novel by Börge Hellström and Anders Roslund. Aviron will release Di Stefano's The Informer in theaters starting August 16th, 2019 next year. First impression?